US Non-farm Payrolls came in above expectations at 304K while the unemployment rate inched higher to 4.0% from 3.9%. US Dollar Index closed lower for the week marking its second consecutive weeks with losses due to the dovish tone from the FOMC meeting last Wednesday. The progress on the US-China trade front also put the buck under fire. US Chicago Fed purchasing managers’ index dropped to a level of 56.7 in January, lower than market expectations for a fall to a level of 61.5 with previous month being 63.8. ISM Manufacturing Index expands to 56.6 beating expectations of 54.2, shows that the US economy remains on solid footing. Eurozone GDP growth for 2018 dipped to 1.8%, below the expectation of ECB’s forecast of 2.5%. Italy GDP falls 0.2% QoQ, throwing its economy into a technical recession. It is the third-largest economy of the Eurozone and has been weakening since early 2017. Spanish economic growth rose past market forecast to 0.7% QoQ. Germany suffered a plunge of 4.3% in retail sales in December 2018. 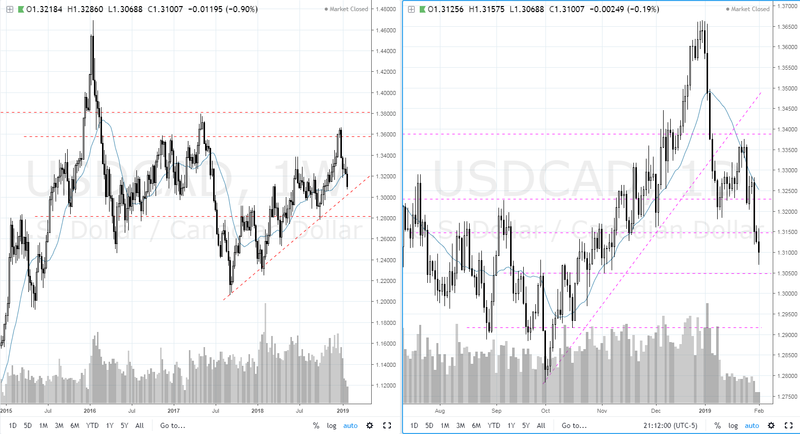 USD-dynamics will drive sentiments on the pair in the very near term, showing some upside potential in response to the now neutral stance from the Federal Reserve. 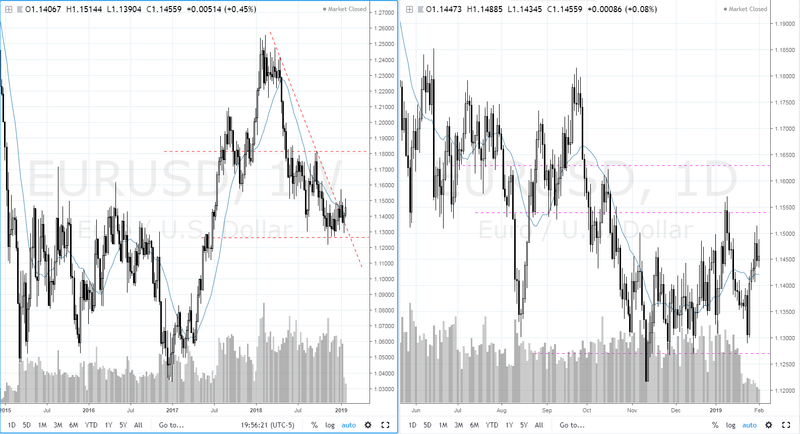 However, geopolitical issues in the Euro region including EU parliamentary elections coming up in May will potentially weigh on EUR/USD in the coming months. The current price structure is slightly bullish, and the price has to break above 1.16 for a smooth bullish run to the target level of 1.18. However, bearishness may set in if the support at 1.13 fails to hold. UK Prime Minister May was appointed by the parliament to re-negotiate the Brexit deal, but the European Union had resisted any changes so far. Key UK manufacturing PMI came in lower at 52.8 in January, below expectations and down from December’s 54.2. UK’s seasonally adjusted Nationwide house prices index rebounded 0.3% on a monthly basis in January, compared to a fall of 0.7% in the previous month. Brexit is the most dominating theme for UK assets and will continue to remain as such, with uncertainty likely to continue. The currency pair is ranging between 1.303 and 1.32 level and was not able to reach 1.33 yet. Volume is getting thinner and upward momentum is getting weaker. However, this week’s candle is an inside bar of the prior week. From daily timeframe perspective, the bullish trend line also supporting the price well from Friday closed at 1.304 level. 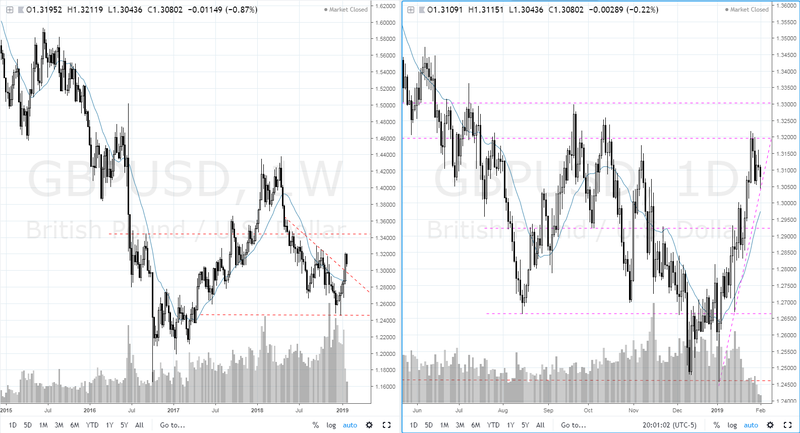 The pair is consolidating around 1.32 zone amid growing Brexit uncertainty. Therefore, significant surprises will be needed to make a splash on the pair. Australia’s AIG performance of manufacturing index jumped to a level of 52.5 in January, following a revised level of 50.0 in the prior month. The nation’s Producer Price Index (PPI) advanced 2.0% YoY. Non-Manufacturing Index printed 54.7, also surpassing the previous period and market’s expectation. RBA monetary policy meeting next week should offer some fresh clues. Retail Sales data to be released next Tuesday is expected to fall, MoM. The pair closed with a bullish stance in the weekly chart and needed more strength to overcome a few overhead resistance levels for a firm bull trend to be established. On the daily timeframe, Friday’s pullback closed with some volume at a support level of 0.725. The upside momentum seems limited as this week, there is an interest rate decision by RBA which may make life tougher for the Aussies. However, it could also continue on a break out above 0.73x and easily add some 100 more pips first before retesting its next resistance. 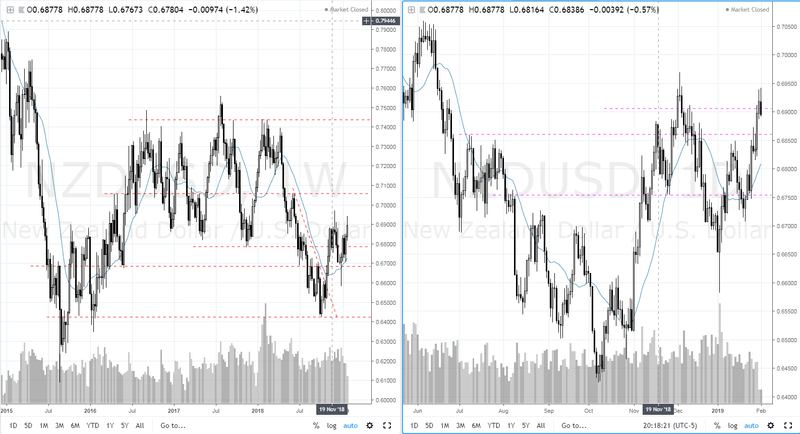 The NZD received an additional short-term boost when credit rating agency S&P upgraded its rating outlook on the government from stable to positive. The currency pair is poised to challenge the December’s swing high at 0.67178 after punching through resistance in the 0.6849-90 area. If the upside momentum continues with strength, there is high probability it could break through the 0.700-0.705 area. The current price is just an inch below that area which closed at 0.68950 for the week. The volume is slowing down, and price action depicts an uptick strength for the coming week if current momentum continues. Crude oil really helped the loonie gain traction for the week despite weak Canadian data. Canada’s manufacturing sector continues to lose momentum with its Market Manufacturing PMI dropping to 53 in January from 53.6 in December. The strong employment growth rate in Canada was maintained across the manufacturing sector in January. US Dollar Index stays below 96 despite upbeat data. Crude oil hit a fresh peak in January after it closed for the week, while the USD/CAD pair fell sharply on Friday and was down by 0.90% by the end of the week. Crude oil is reasserting itself as the main driver of the Loonie. Next support level is at level 1.305, and it will need to break below weekly trendline for more bearishness. Switzerland’s KOF leading indicator unexpectedly slid to a level of 95.0 in December, following a reading of 96.3 in the previous month. Switzerland’s trade surplus narrowed sharply to CHF1.8 billion in December, after exports rose to a decade high level. Switzerland’s total sight deposits slightly rose to a level of CHF576.7 billion in the week that ended 25 January, from CHF576.3 billion in the previous week. US Dollar struggles to make a meaningful recovery, and the Index closed below 96. 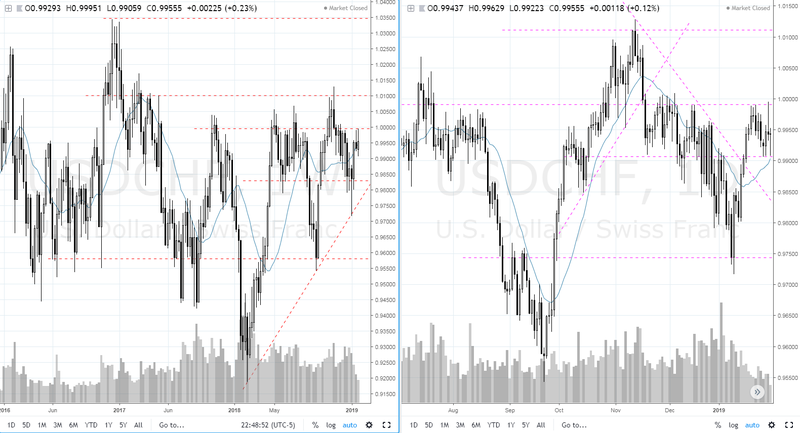 The pair has been trading sideways within the range between 0.9906 and 0.9995 since January. We would prefer to see a decisive break below 0.991 before we can be confident of the pair’s downside exit of the range. On the upside, we would like to see a break above 0.999 zones with incremental volume to boost its upward momentum. Japan’s unemployment rate unexpectedly fell to 2.4%, and it is at a 26-year low level in December. Japan’s final manufacturing PMI fell to a level of 50.3 in January, compared to a reading of 52.6 in the previous month. Japan’s flash industrial production declined by 1.9% YoY in December, below market expectations for a drop of 2.3%. Overall upbeat US data is cracking key barriers and on track to complete a reversal pattern after the FOMC and NFP data were released last week. The bull signal is forming and had closely above 109.5 for the week and re-exposed the key 110.0 barriers for the next trading week. On the downside, it has to break 108.0 level strongly to drive it lower. If the data fails to preserve the market’s confidence on current momentum, there will be less participation from market players as they may sit on the fence while waiting for clearer direction. This will cause the price to range between 108 – 110 for a short while till some exciting news act as a catalyst to drive the prices. The information provided here has been produced by third parties and does not reflect the opinion of AxiTrader. AxiTrader has reproduced the information without alteration or verification and does not represent that this material is accurate, current, or complete and it should not be relied upon as such. The Information is not to be construed as a recommendation; or an offer to buy or sell; or the solicitation of an offer to buy or sell any security, financial product, or instrument; or to participate in any trading strategy. Readers should seek their own advice. Reproduction or redistribution of this information is not permitted. 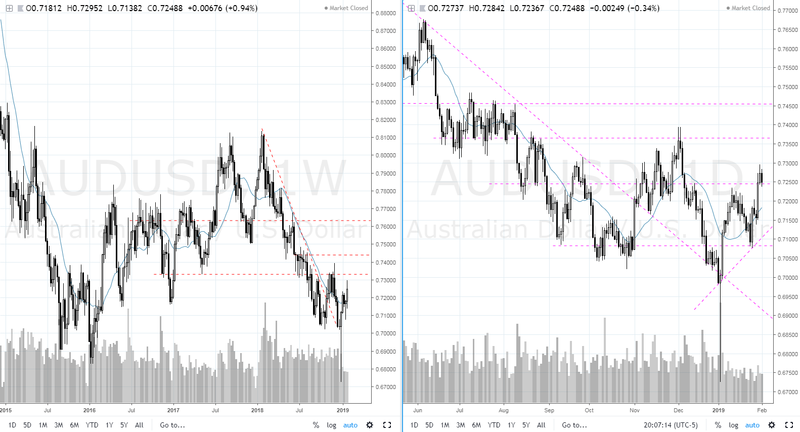 Hidden Opportunity or Danger Lurking Ahead for AUD/USD? 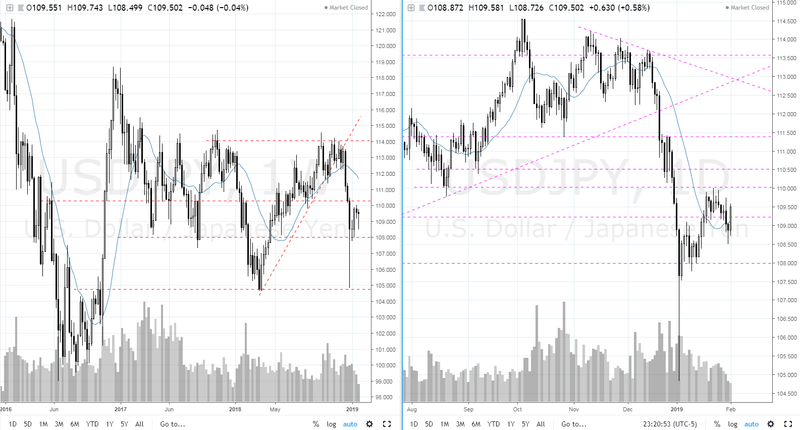 Charts of the Week - Gold showing first signs of weakness + can USD/JPY extend the rally?